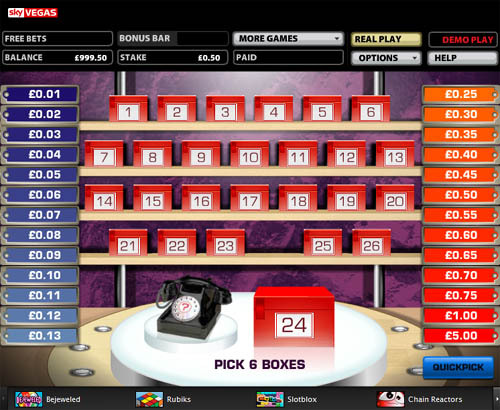 Of all the Online Games based on TV Shows, the Deal Or No Deal Online Game is by far the most popular. With its simple but addictive format where the dilema is whether to stick with what you have or risk that you may be able to win even more. You can of course lose almost everything and go home with only 1 pence, but that is the great thing about the Deal Or No Deal game. To play the free demo just pick a box, this will be your box. Then pick six other boxes which will be opened and their contents reveiled. The value of their contents will determine the amount that the banker will offer you for your box. If you are not happy with the bankers value, you simply click 'No Deal' and pick six more boxes. Keep going until you do accept the bankers offer, or go all the way to the end where you keep the contents of your own box. The UK was the first country to broadcast DOND in 2005 produced by Endemol and hosted by Noel Edmonds, it then went on to be broadcasted in over 90 countries. The UK version starts with 22 Boxes ranging from 1p to �0,000. So far the UK DOND Jackpot has been won 4 times, the first being Laura Pearce in 2007. In the USA the jackpot is $1 Million and has been won 2 times. The basic format of the game has been used in corporate training excercises to train stock traders whether to stick with a modest profit or try to make a larger profit while risking making nothing at all.